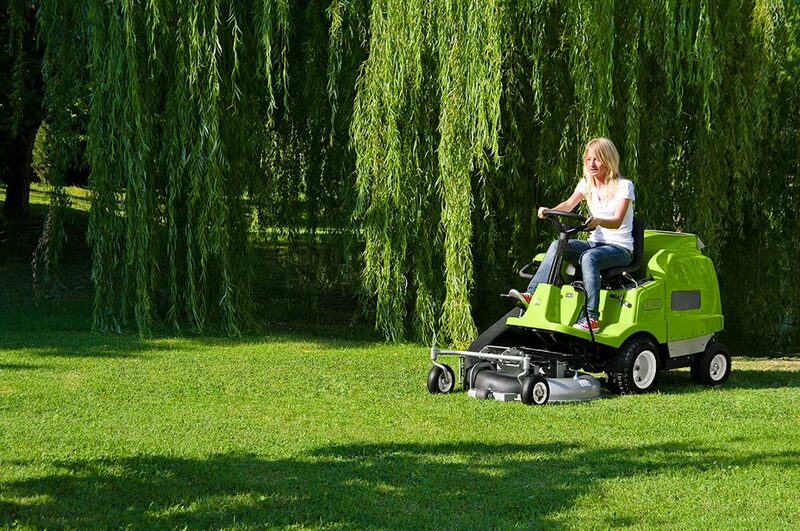 A machine to enhance your lawn! 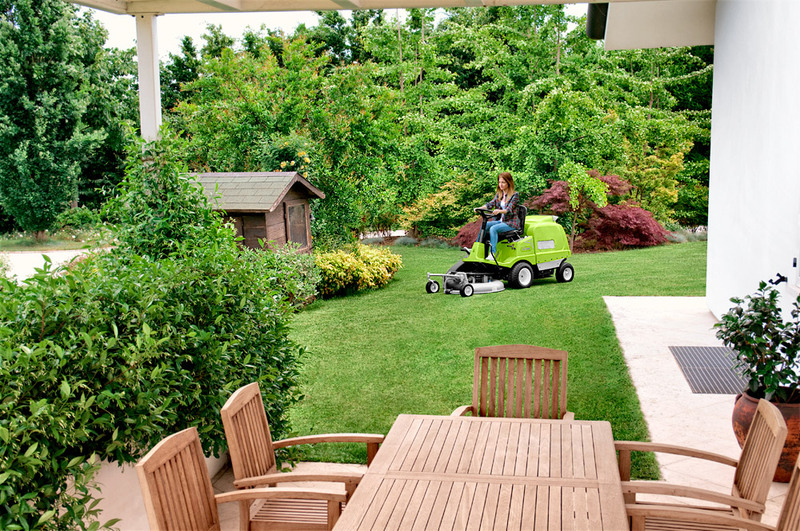 You will derive great satisfaction around your garden with Grillo FD220 R thanks to its pleasant drive and the quality cut. 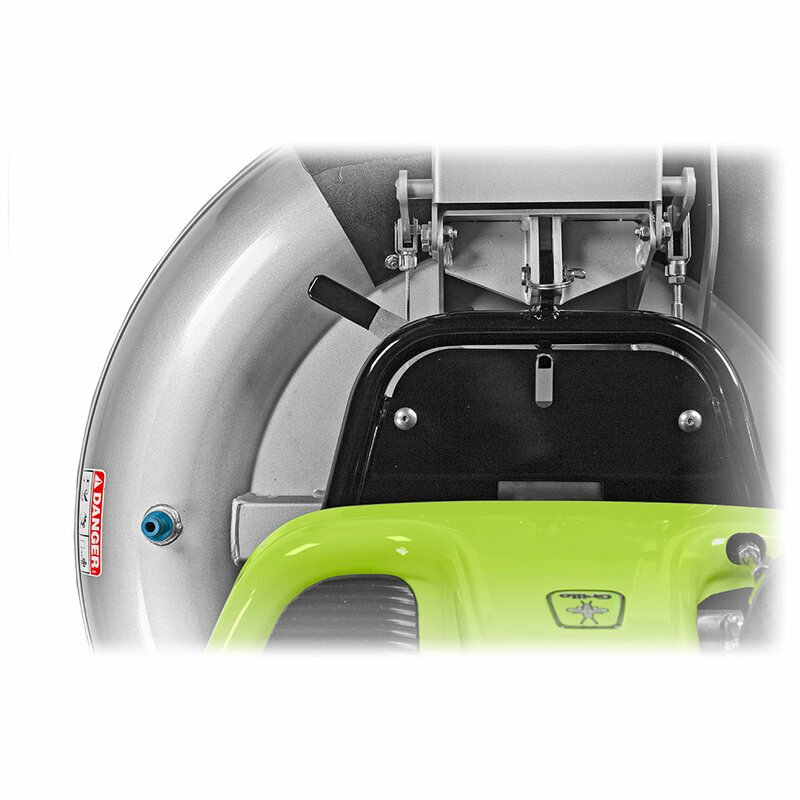 The single blade cutting deck with collection is front mounted and ensures perfect visibility on the area to be cut. Driving with the hydrostatic transmission and the easy light steering makes work a pleasure! 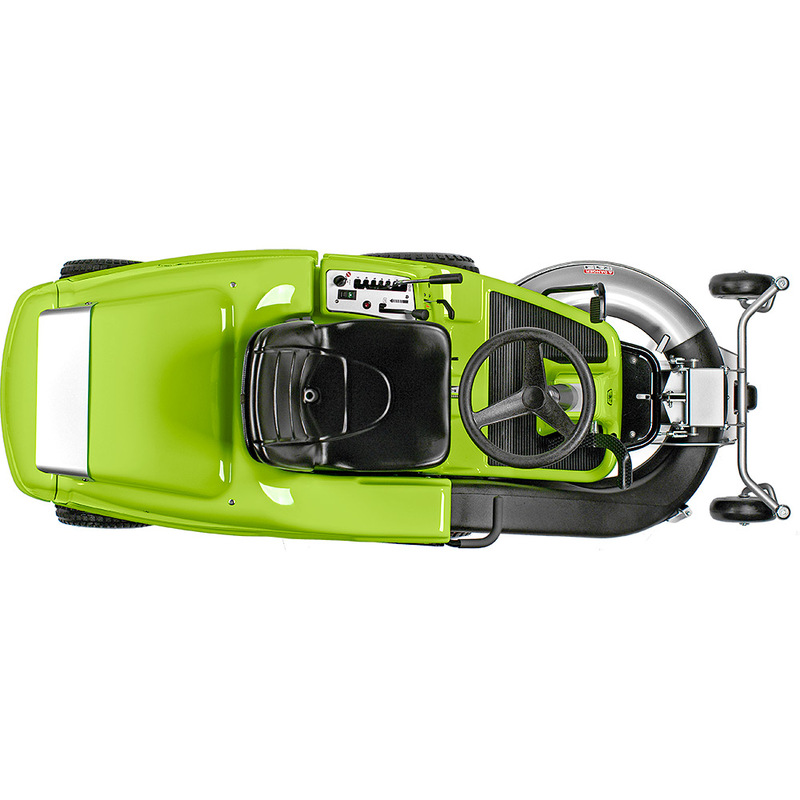 The extremely small turning radius and all controls reachable from the driver’s seat, make the Grillo FD 220R a mower within everybody’s reach. FD220 R’s single blade cutting deck is positioned in front of the operator; the visibility of the cutting area is extraordinary. 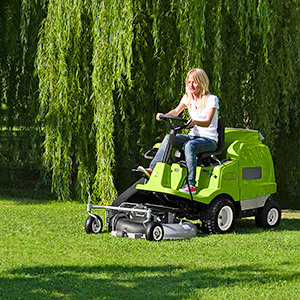 It ensures a precise cut below bushes or low-positioned branches, therefore reducing the time spent using a strimmer or hand mower to finish off the areas. Cutting width is 800 mm, the cutting height varies from a minimum of 30 to a maximum of 90mm and adjustments are made by lever with seven positions which is located next to the driver’s seat. The cutting deck with collection can be converted into a mulching deck or with lateral discharge by utilising the optional kits. The cut grass is fed into the discharge chute which leads directly to the grass catcher with 200 L capacity. 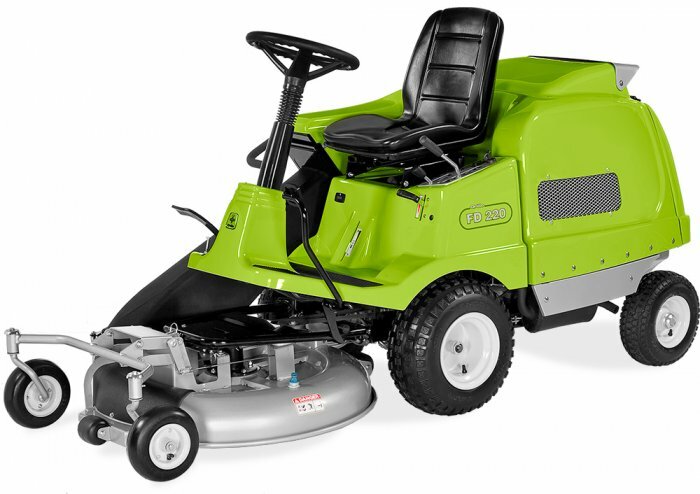 The special blade profile of the FD 220 R allows extraordinarily cutting and collection even when the grass is humid. 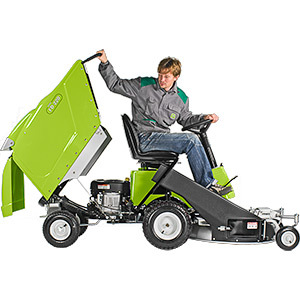 Grillo FD220 R is an extremely manoeuvrable and agreeably drivable lawnmower! The specially designed steering geometry allows an inner turning radius of just 30 cm! The hydrostatic transmission is controlled by a pedal, forward to go forward, back to go back!. The pedal is fitted with a “damper” to enable smooth operation. In tight areas, when manoeuvring or in the presence of obstacles, Grillo FD220 R shows how agile and easy to use the FD220 R can be! 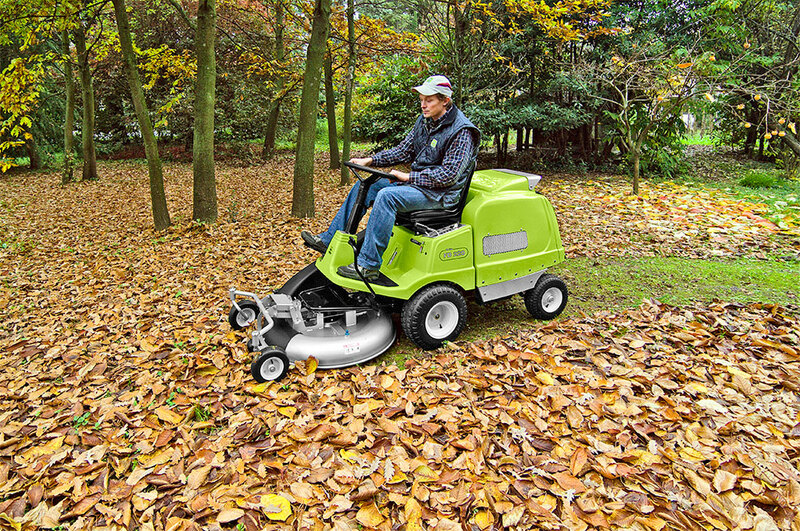 The floating cutting deck ensures a perfect cut even on undulating grounds. 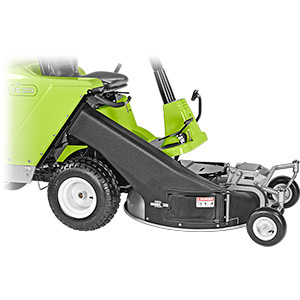 The rear swinging axle, the tyres with antiskid profile, allow, together with the pressure adjustment of the cutting deck on the ground, to follow with extreme precision any bumps and fold, and therefore eliminate the possibility of scalping the grass. 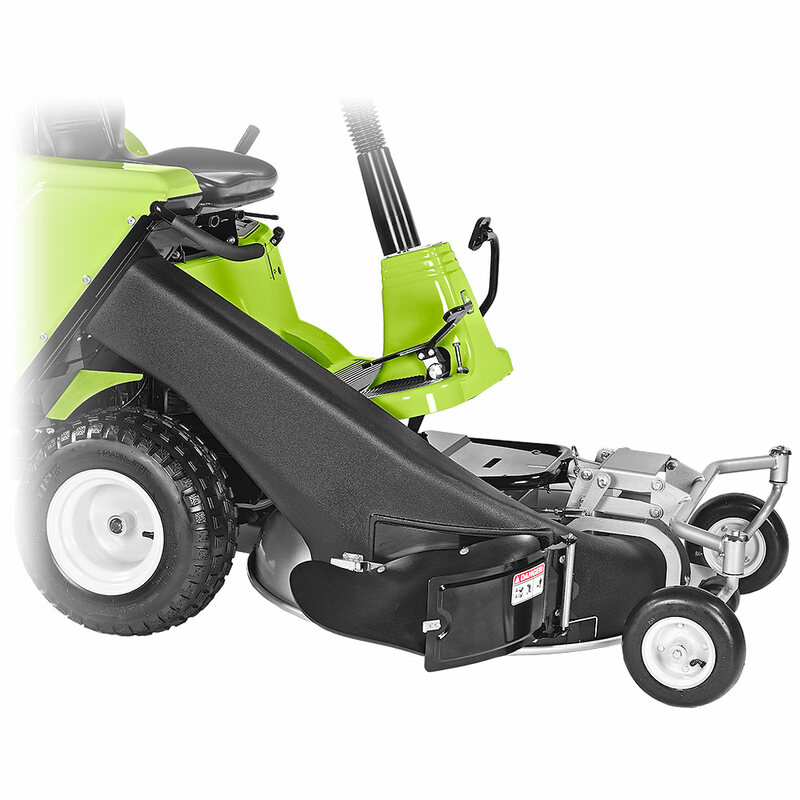 The cutter deck’s pressure adjustment on the ground is made by activating a simple hand wheel positioned below the driver’s seat; the device modifies the weight balance between cutting deck and drive axle of the FD 220 R for a greater adherence on slopes. Speed ranges from 0 to 9km/h is continuously adjustable. Maintenance of your garden will be rapid and to a high quality standard. 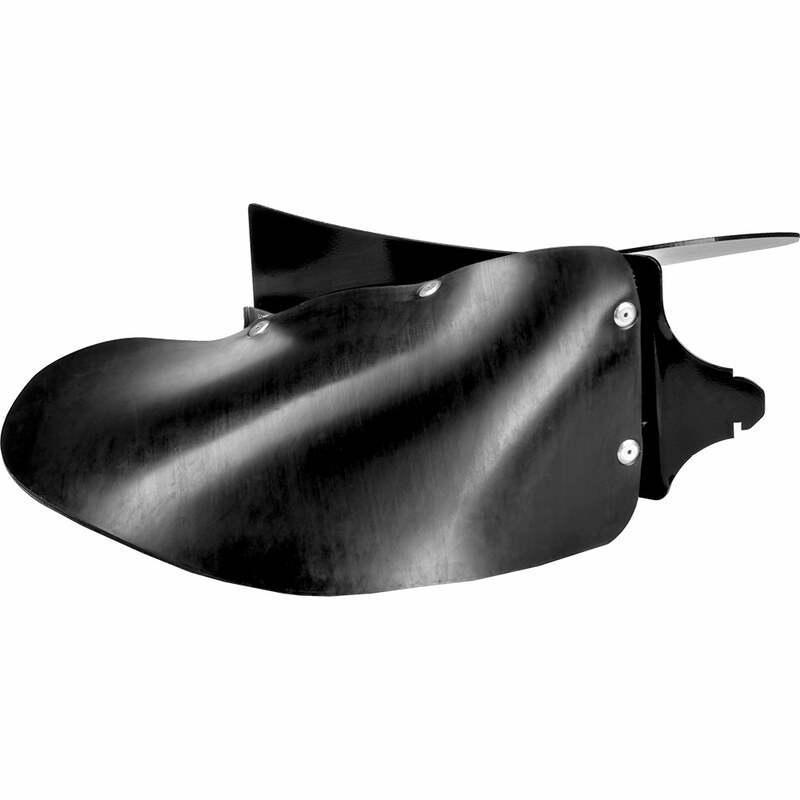 The blades are automatically disengaged once the grass catcher is full; the cutting process will be stopped in order to avoid blockages. There is also the possibility to choose the “buzzer indicating” option (the simple removal of an electric connector is all that is needed) that signals that the catcher is full. Emptying the FD 220 R’s grass catcher is that easy! 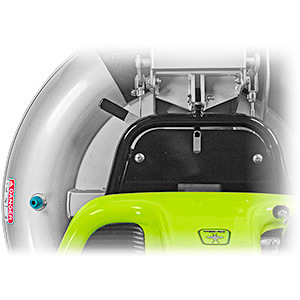 Simply reverse to your designated area, it will be sufficient to lift the lever next to the driver’s seat by remaining seated; the grass catcher will lift up and open automatically, completely emptying itself. 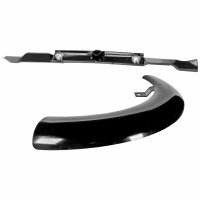 The blade operates via an electromagnetic clutch, it is push button operated and has an LED to indicate that it is functioning. 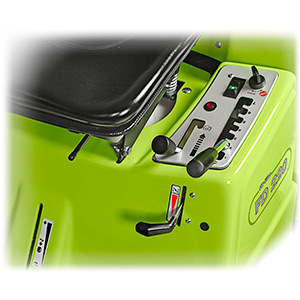 The disc parking brake is controlled by a practical lever, it allows you to get off the machine with the engine running, and the cutter is disengaged. Two types of petrol engines are available: Vanguard 14 HP and Intek 10HP. Both engines have electric start, are of OHV and with cast iron cylinder liners. Both incorporate the latest technical features to ensure their reliability, keep emissions low, consumption reduced and performance high. FD 220 R’ s exhaust was designed by Grillo and belongs to the “Super Silent” series with remarkable noise reduction and minimum exhaust resistance. Grillo FD220 R’s design is up to the minute! The fairing’s modern line as well as the as the attention for the last detail will immediately impress everybody! The driver’s position of the FD 220 R is ergonomic. 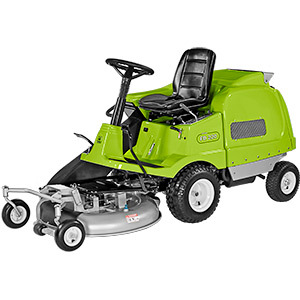 The dampened and adjustable seat, together with the height adjustable steering wheel, makes this a lawnmower to enjoy for cutting grass or even leaf collection. Once you have finished using the machine, cleaning the cutting deck will always be quick and simple for everyone! 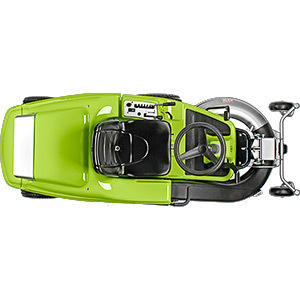 The cutting deck is equipped with a quick coupling so that by connecting a water hose the whole cutting deck can be cleaned with minimal effort. 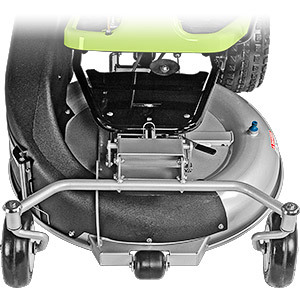 The transmission components and the engine transmission parts are accessible by lifting the grass catcher or the seat. 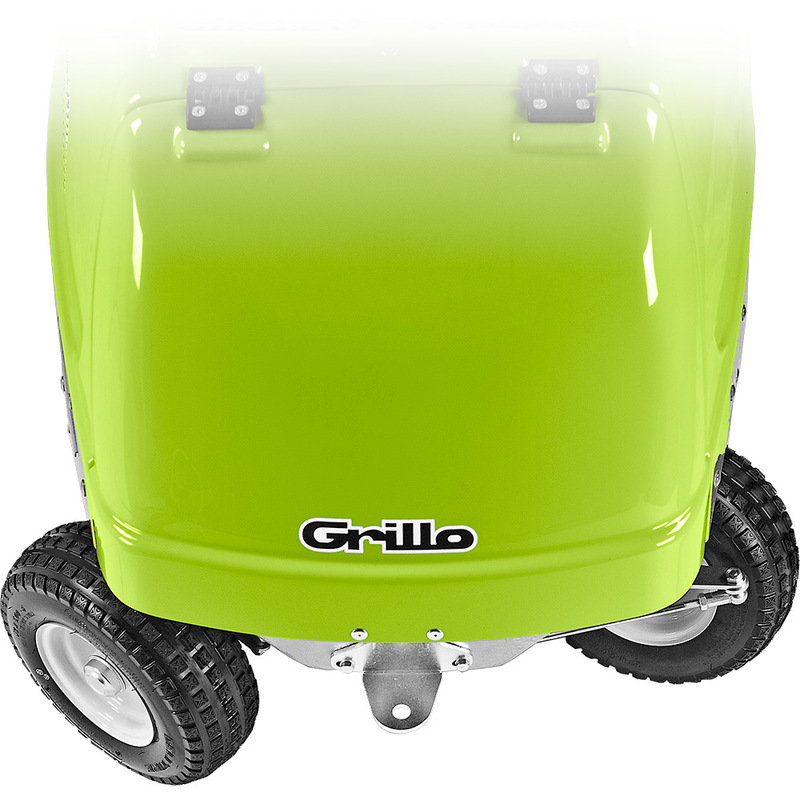 Chassis, cutting transmission, cutting deck, are all built by Grillo using premium materials and cutting edge technology. All this to achieve constant and 100% high quality control levels. 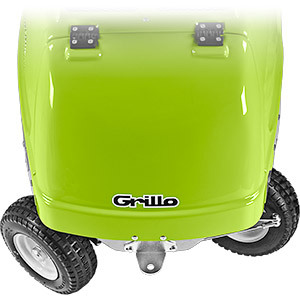 Painting of Grillo machines consists of a double electrostatic powder coated process. At the first stage are the washing baths and the preparation, then a first protective coat is applied which, together with the baking in the oven, turns out to be the best base for the application of the finish. The second coat consisting of powder coating and further baking in the oven at 190°C, this then gives the characteristic hardness and brilliance. The FD220 R have been assembled with care in every detail and tested scrupulously by specialised personnel. Final inspection includes running the engine in order to check its functionality! This is a further and final guarantee of a high quality product. 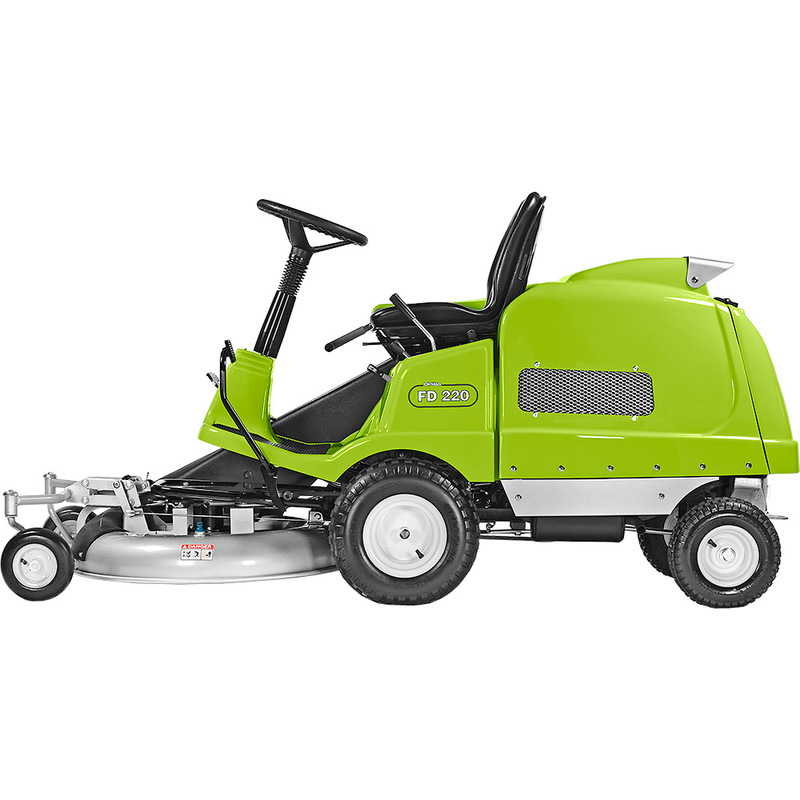 FD220 R , as with all Grillo products, is designed and built to last and retain their value over many years.